NEW YORK — It was in the whimsical and colorful moccasins, and in the batik prints and beachy dresses. 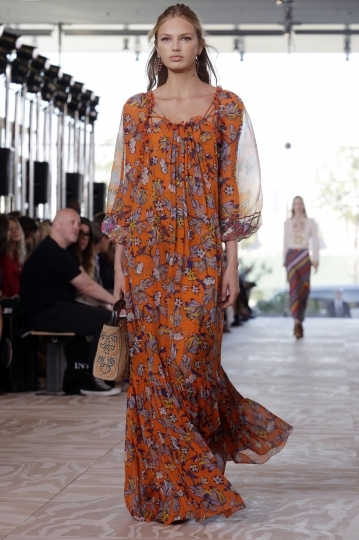 Tory Burch was definitely bringing a little West Coast spirit to her usual East Coast chic. 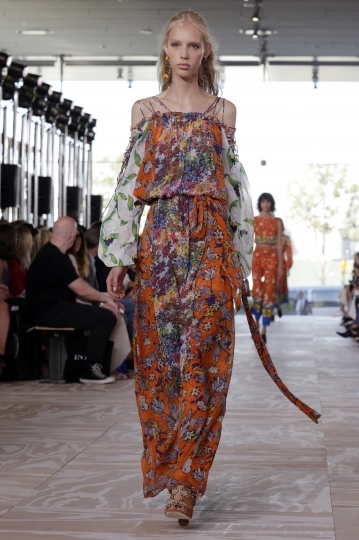 But first, Burch's runway show Tuesday — in the chic setting of the Whitney Museum of American Art — began with some classic East Coast "hostess prep," as the designer calls it. There was lots of kelly green and pink — as in the opening number, a pink-trimmed green cardigan with a garden-print blouse and long cotton skirt, or in a tweed checked pantsuit with a garden-print top. 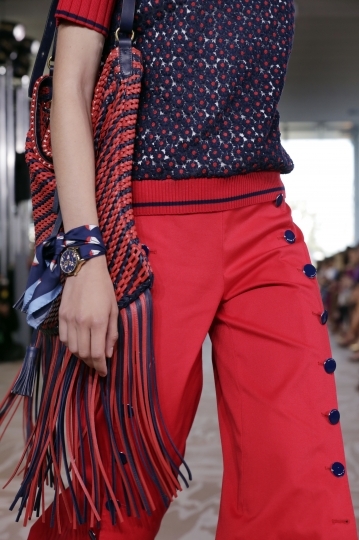 There was also a preppy boating theme, in outfits like a short navy jacked paired with "Marina-print" burlap pants emblazoned with sailboats. Or a sweater covered with the word "Ahoy." 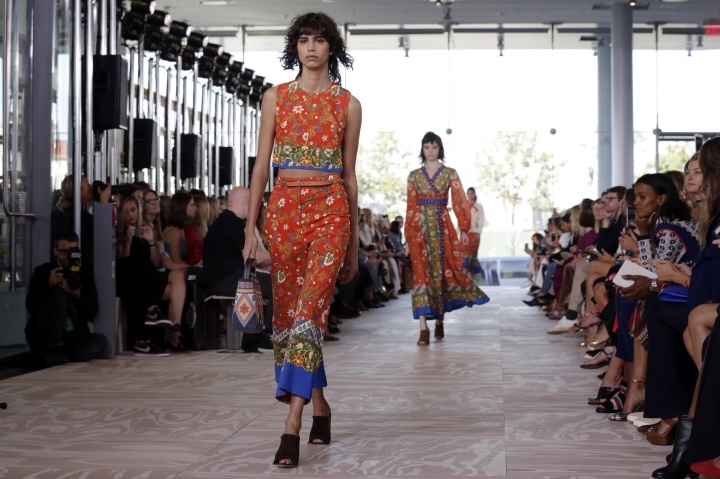 From the Connecticut yacht club to the beach towns of the California coast: Burch brought out caftans, batik prints, board shorts, macrame and those moccasins — some colored and with heels. "It's about contrast," Burch wrote in her production notes. 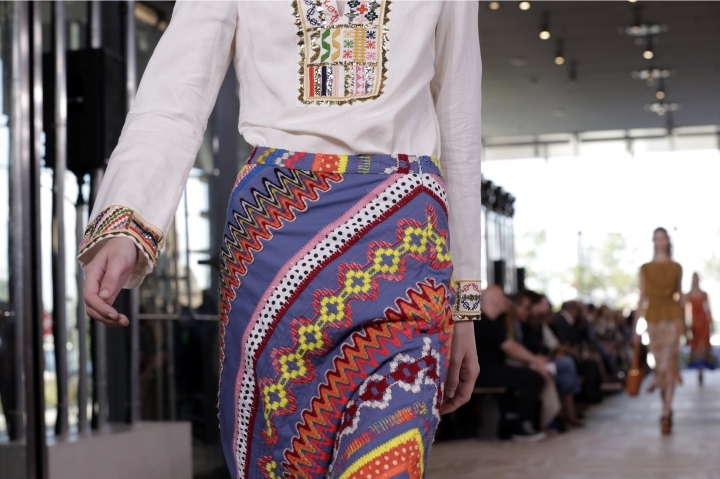 "Graphic motifs and engineered prints, rope and rickrack, pearls and macrame, mules and moccasins, structured and bohemian ease." Among the front-row guests was actress Jessica Alba. As for the music, it was a rather unusual mix; from the Bee Gees to Beyonce's searing "Hold Up."